Hermit crabs live on the land, but that's not where they reproduce. They journey to the ocean for finding a mate and releasing the eggs. These grow into juveniles in the sea, becoming hermit crabs after metamorphosis. From the moment two hermit crabs mate to the time a juvenile crawls into his first shell, about four months passes. Homeownership comes a lot quicker for a hermit crab than it does for us. Hermit crabs don't live in the water, but they live relatively close. One of the reasons for this is because that's where they mate. In some areas, hermit crabs travel to the water in mass for a mating ritual in which all find mates. The males and females come out of their shells a little -- not the whole way -- and the male transfers a spermatophore to the female. When it implants, it can deposit thousands of eggs along the female's abdomen. The female carries eggs for about a month, during which the eggs go through their supply of yolk. The female spends this time out of the ocean, staying away from saltwater until it's time to hatch the eggs. You can tell when the eggs are about ready to hatch because they change color as a result of the yolk depletion -- they go from being brick red to dull dark gray. When the eggs are gray, the female travels back to the ocean and submerges herself in the water, simultaneously hatching the eggs. When saltwater surrounds the eggs they hatch, releasing undeveloped hermit crabs known as zoeae into the water. Because hermit crabs rely on saltwater to hatch their babies, hermit crabs kept in freshwater captivity won't mate. The reproduction process isn't over once the eggs are hatched -- zoeae have to grow up. For a period that lasts up to two months, the zoeae go through various stages of metamorphosis until they become crustaceans called megalopae. After another month or so, each megalopa finds its first shell and starts spending time outside of the water. 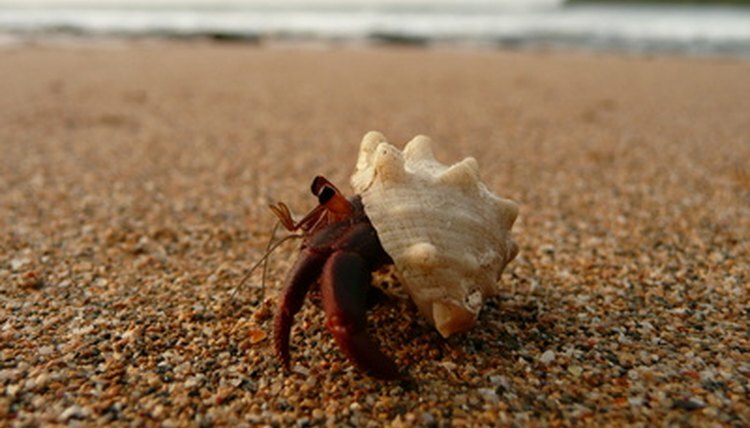 After it buries itself and molts for the first time, it is a genuine hermit crab -- albeit a juvenile -- that lives on land instead of in the ocean.